Pic(k) of the week 30: Bending the light! My photographic creativity in Dubai has been at a year long low lately... Last Tuesday afternoon I decided to change that and took one of my less used lenses for a spin. The lens I brought was my Lensbaby 3G. It is a manual focus, special effect lens, mounted in a flexible housing which allows it to be focused and tilted at the same time. One can shift the focus to the side of the lens making for some very dramatic effects. I like to call it, "bending the light". An very interesting aspect of the lens, is the way the aperture is changed. One just drops in one of a supplied aperture-rings to increase or decrease the opening (aperture) of the lens. Very unique! Walking around a large shopping center like Dubai Mall, with a DSLR normally does not attract any attention, but using this award looking lens surely does! One of the subjects I photographed with my Lensbaby was "the Waterfall"", more than a dozen sculpture divers jumping next to a waterfall, 4 floors high. Towards the end of the shoot I unfortunately lost one of the metal posts to fix the tilt... I emailed lensbaby with the request for sending me a replacement one and they replied within a few hours that one would be on the way shortly from the US. What a great service! Checkout plenty of new Lensbaby lenses here. More of my Lensbaby images can be found by using the find function on my site. Tomorrow morning I"m leaving for a 3 week stay in Belgium... Taking quite a bit of photography gear with me, there should be plenty of opportunities to give it a good workout! Those of you following me on Twitter and Facebook probably know that last Saturday, I attended Scott Kelby's Worldwide Photowalk in Shanghai, China. Scott is the president of the Kelby Media group and has published an amazing number of books on photography and Adobe software like Photoshop and Lightroom. Three years ago he started a Worldwide Photowalk to promote one of his new books. The yearly event quickly grew to the largest photo-walk in the world, with walks organized all over the globe in 1111 places and attracting a total of more than 33000 attendees! Needless to say, Scott only attends one walk and unfortunately it was not the one in Shanghai! Sorry, yes I can hear you ask, "what exactly is a photowalk"? It is a walk by a group of photographers (30 to 50) along a pre-planned track where all participants are asked to shoot images of things they encounter along the track. People normally split up in smaller groups or might even walk individually. Photographers of all caliber can attend. Including people shooting with compact cameras. After the walk, a social event like lunch or dinner is organized where people can check-out each-others photographs and talk photography! At a later stage images are put up on a Flickr site to be shared with the community. Because of work commitments I could not attend the Dubai one but I happened to be in Shanghai where I was able to participate with 35 other photographers. US citizen, John Luker, living in Shanghai did a great job organizing the event. Thanks John! We started at the Jian-An temple. An excellent architectural mix of old and new. 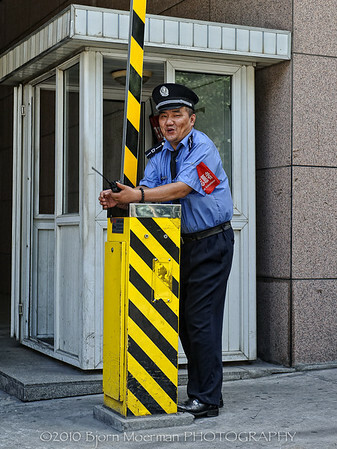 It was noticeable that the Chinese people were not very willing to be photographed. This is in sharp contrast with the people from the Subcontinent (India, Sri Lanka, Bangladesh and Pakistan) who would do everything to jump in front of the camera. Nevertheless this security guy did give me a quick smile! Right after I made this picture the women closed the door. Surely would have liked to shoot some more. These guys waiting for the traffic lights were a perfect subject. Even though I did shoot several frames, I did not manage to have all 3 guys looking towards the camera. 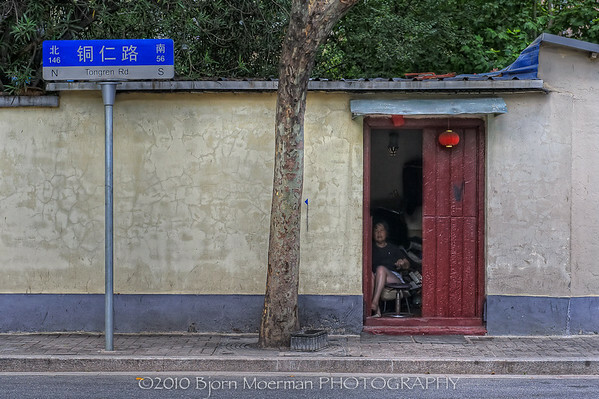 Throughout the walk I really wanted to give a China feel to each and every image I shot. 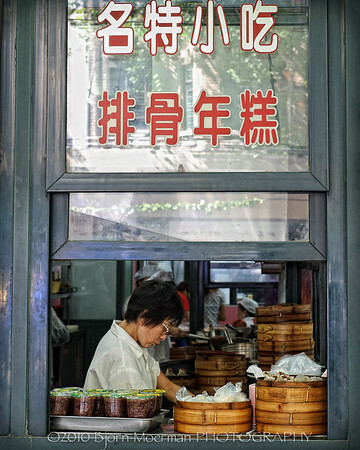 I hope that this women preparing dumplings full-fills my vision. 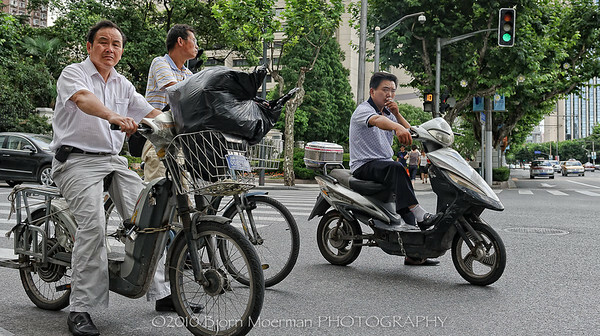 Cars are now much more common in China than a few decennia ago, but bi and tri-cycles are still very much present wherever one looks. The images of all participants of the Shanghai 2010 Photo-Walk can be found in this Flickr group or for a better viewing experience through Flickriver. For my own Shanghai gallery click here. Remember, "wherever you go, there you are!" Pic(k) of the week 29: Zebra butts! In about 2 months time, I should be off on a 2 week self-drive photo-safari around Namibia. Travelling by 4x4 (roof-tent equipped), we plan on driving around 2000 to 2500km around the ex-German colony, used to be called, South-West Africa. One of the highlights will probably be the Etosha National Park. A very interesting game reserve centered around a large salt pan desert. While planning the trip, I felt the urge to re-visit my Kenya photo gallery. All of these images were shot on a Nikon D200 body, during my first photo-safari in September 2008. What an experience it was! 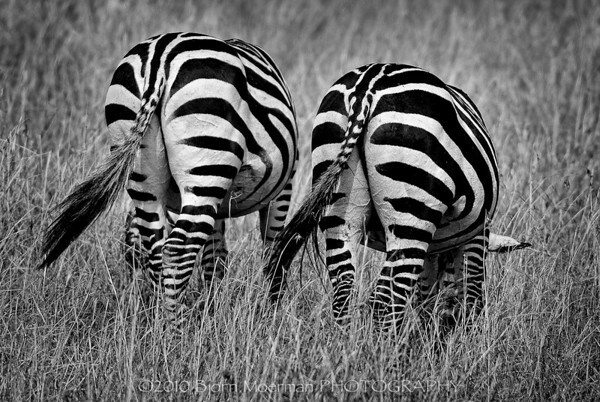 One of my favorite images of the trip is this shot of 2 Zebra butts... Today I decided to re-edit the image with the newer Lightroom 3 RAW processing tools and subsequently converted it to Black & White. Those of you interested in the color version of the image can see it here. I'm interested in knowing which version you like more. Feel free to leave a comment below! Safari Kenya by Bjorn Moerman PHOTOGRAPHY from Bjorn Moerman on Vimeo. Click on the video above to view a 3 min Vimeo photo-slideshow of my Kenyan safari adventure. Best viewed in full screen by clicking on the icon at the right bottom bar. Just a week ago, I was in the North African city, Tunis, the largest city and the capital of Tunisia. 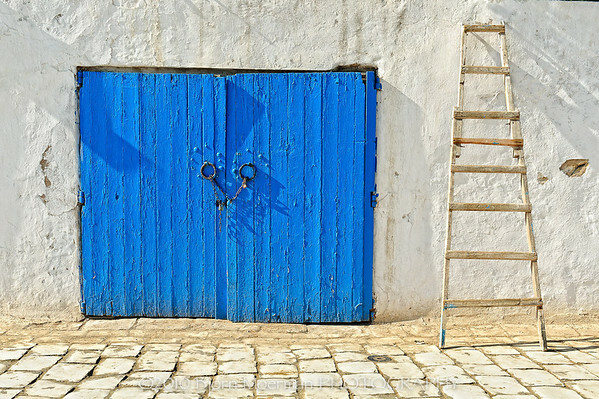 20km Northeast of the city center, right at the coast line, we find Sidi Bou Said, a village named after a Muslim saint who lived there. The small town sits on a hill overlooking the Mediterranean Sea. A great place for watching the sun go down. 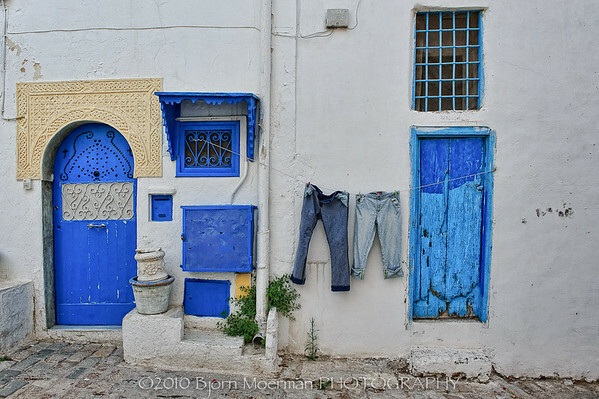 It is known for its blue and white colors all over town. 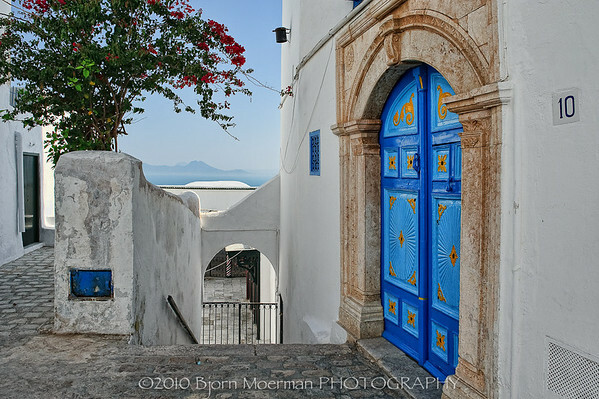 Especially during the summer months, Sidi Bou Said is buzzing with tourists and the like. And yes, on this Saturday in July there were loads of them! Some of you will know that I'm not a big fan of busy tourist places like this. So I used my usual technique...where ever tourist were turning left, I took a right! This way I got to places that only the locals get to see. 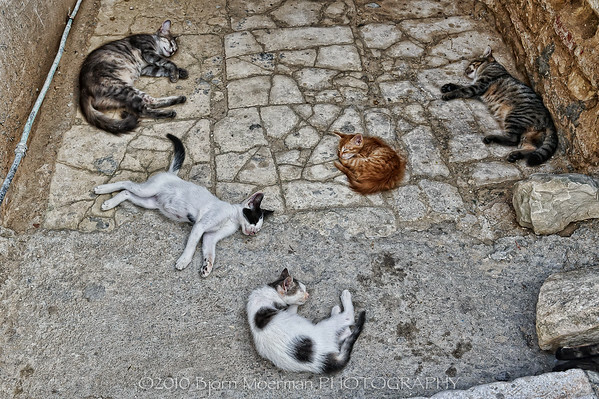 Even the cats were avoiding the noisy tourists! Including this one, that became my favorite image of the shoot! More images of the shoot can be found here. Feeling the urge to go back to India, I found a small batch of un-processed images shot in Jaipur on my latest trip to India a few months ago. 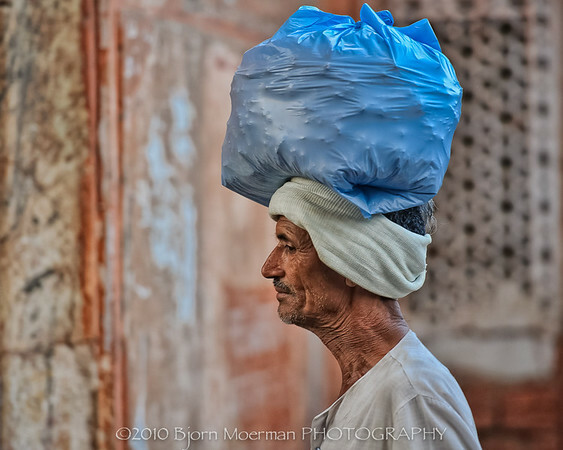 The one that stood out was an image of this man walking home after completing some shopping in Jaipur, Rajasthan. 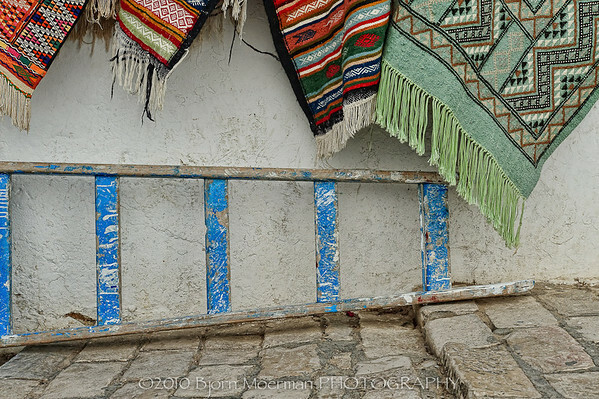 The complimentary colors (blue and orange) in the shopping bag and the background, make for a pleasing image. Expect another blogpost about my latest trip to Tunisia, in the next 48hrs. Temperatures are rising above 45C. Humidity reaches year long highs... Summers in Dubai are harsh! Not a great place for outdoor photography! Being inside under the comfort of airconditioning makes it perfect to reflect back on some images of the past. While scrolling through my Lightroom 3 image library, I noticed that exactly one year ago I was in the fashion capital of Europe, Milano (Italy). Somehow a batch of images of that trip had never been processed. A perfect moment to give my brand new 27 inch iMac a workout! Milan (Milano in Italian), a cosmopolitan city in the Northern part of Italy known for its high end shopping. It houses the oldest shopping mall in the world. 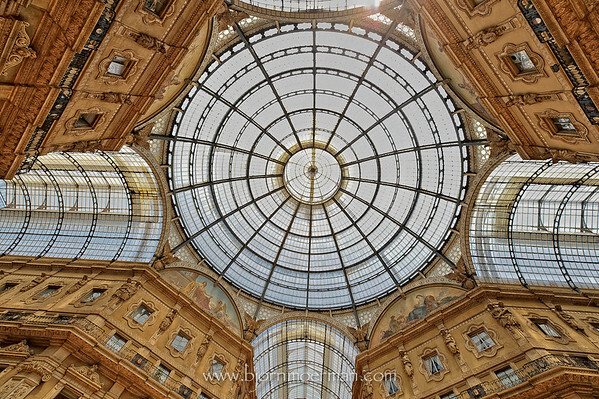 The Galleria Vittorio Emanuel II, is a glass vaulted arcade named after Vittorio Emanuel II, the first king of Italy. The image above shows the central glass dome. The building was completed in 1877 and has been an important step towards the modern glazed and enclosed shopping malls. It houses shops like Prada, Guicci, Louis Vuitton, but interesting enough also a Mac Donalds. A bit out of place if you ask me! More images from Milano here!